This recipe comes from one of my favorite cookbooks – Feeding the Whole Family. I love it because it’s full of simple basics like how to cook different grains, beans and simple blanched vegetables. And then it builds on the basics to create delicious, simple whole food meals. I’ve mentioned before that I love salads with lots of stuff in them. When I make a salad, lettuce is just one ingredient in a mix of lots of other stuff. You gotta keep it interesting. Kale by itself is… well, I’ll be honest, it’s not good. But when prepared the right way it can be absolutely delicious. 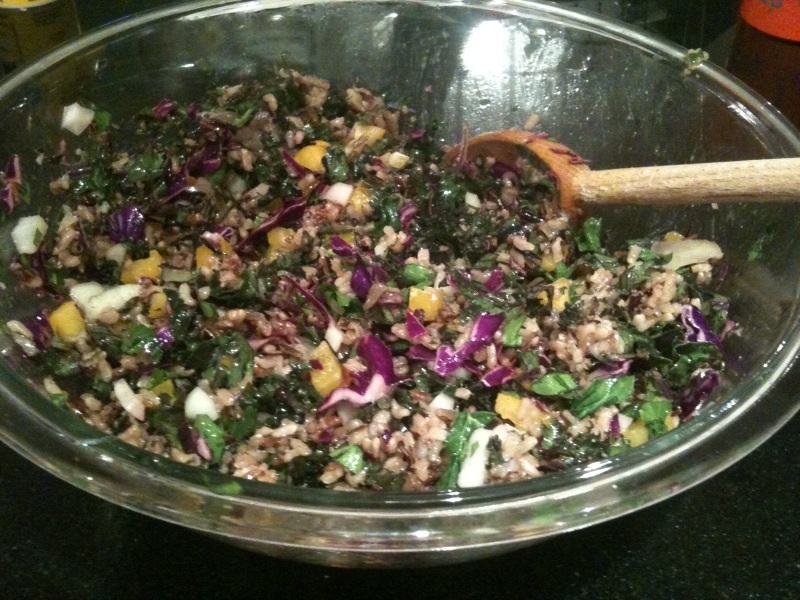 I’ve never been much of a fan of it raw, but in this salad it works. The difference is in the combination of flavors and lemon to soften it. Plus it’s so colorful – really bright and vibrant. When it comes to food, the more colors the better! 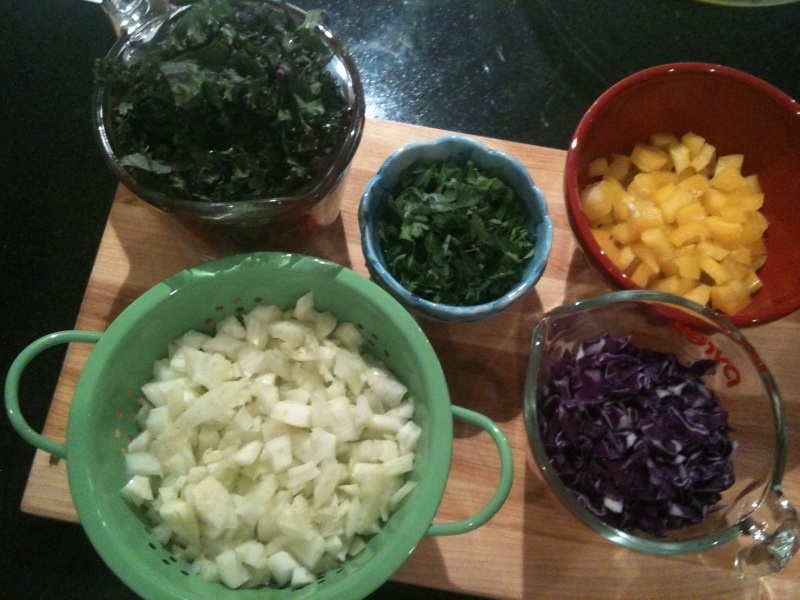 And all that color makes for one gorgeous side dish… and a great way to get in more greens. Bring water to a boil. Add butter (if using), 1/2 tsp of the salt, and rice. Bring to a boil again, cover, lower heat, and simmer 60 to 65 minutes. Combine lemon juice, olive oil, garlic and remaining 1/2 tsp of salt in a large serving bowl. Add fennel, red pepper, cabbage, parsley, and greens and toss thoroughly. Once the rice is cooked, cool until it stops steaming but is still warm. Place it on top of the dressed vegetables. 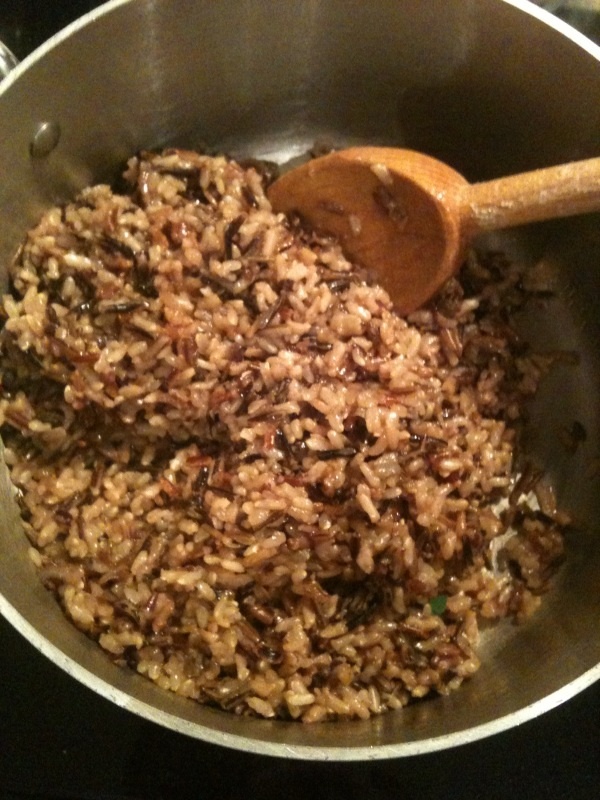 Allow rice to cool and then toss with vegetables. Adjust to taste, adding salt or lemon according to preference. Garnish with cheese if desired. Looks great – I will have to try it!